The position of women in the New Kingdom was based on a unique combination of ancient tradition and modern sophistication. The opportunities available to most women were limited by centuries of tradition and deeply held religious beliefs. But women also had legal and financial rights that were remarkably modern and sophisticated. This was in marked contrast to the customs in other cultures during the same period. Egyptian society was highly structured: a woman's social position was largely defined by the status of her father and husband. According to 'Maat', the Egyptian view of the order of the universe, it was definitely a man's world. Only men were allowed to work in the government, so only they could hold real power. But high ranking women - for example, the wife, mother or daughter of an important politician - exerted a lot of covert influence. Very occasionally, a woman ruled in her own right. 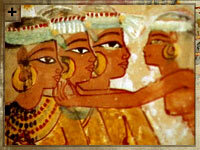 For example, Ahhotep ruled while her son, Ahmose, was still growing up and Hatshepsut even became pharaoh. But she still needed to rely on the reputation of her late father and had to pretend he'd nominated her as his successor. Outside the royal family, women were allowed to take paid work. Some wives helped out their husbands with farm work, while others weaved for extra money. Records from the village of Deir el-Medineh show that some women bartered surplus supplies. Few women actually worked outside the home as it was frowned on. While their husbands and fathers held down jobs, the main role of Egyptian women was to look after the home and the children. As there was no contraception, women would have spent much of their life either pregnant or breastfeeding. This, along with the housework, would have left little time for other work. Yet women enjoyed extensive legal rights. Egyptian culture recognized a wife as her husband's closest companion. In fact, wives were seen as so important that it was an offence against Maat for a pharaoh to rule without one. As her husband's closest companion, an Egyptian wife was allowed to represent him in his business affairs. They were equal to men before the law and legally responsible for their actions. Women could be named in legal contracts, attend court on their own, bring lawsuits, and even own or rent property under their own name. Egyptian law gave every child an equal inheritance. Although most women were too poor to own anything other than a cooking pot and some clothes, this meant some women were quite rich and financially independent. For these women, life was good and many were very cultured. They might own land or have monuments in their name, and they had access to makeup. This involved grinding minerals to make a paste. Ground serpentine made a green eye shadow, while others blacked kohl around the eyes or mixed red ochre and animal fat to produce lip paint and rouge. Early pregnancy tests told them when they were expecting a child. If a pregnant woman urinated on wheat and barley, her hormones would cause both to bud. It was extremely accurate and the idea isn't much different from pregnancy tests today. Once pregnant, women wore amulets honoring the pregnant god Taweret to help them in childbirth. This sums up life for Egyptian woman - a strange mix of the very traditional and the surprisingly modern. They were limited by their gender, but they were also highly respected. Most remarkable, were the legal rights and responsibilities they held. Western women would not achieve these for another 4,000 years.